Sunroad acquired the leasehold for the easternmost tip of Harbor Island, which previously housed the Rubens and Ruben E Lee restaurants. The redevelopment of the former Reuben’s is an excellent example of Sunroad’s unique ability to identify an opportunity and execute a successful repositioning of a singular asset. Sunroad brought in the Cohn Restaurant Group and redeveloped the site into one of the most successful restaurant projects in San Diego. Island Prime/C Level Lounge opened in 2005, and has grown to be the highest per-square-foot-sales restaurant on Port Tidelands. Coasterra opened in 2015 in an unparalleled location, which includes bar/lounge, restaurant and event space. This 24,000 square foot space features Regional Mexican cuisine. Of the 300 seats in the restaurant, more than two thirds will be outdoors just steps from the bay with a view of the San Diego skyline located on a large dining deck with an outdoor bar. The main dining area, which seats 80, is dominated by a floor-to-ceiling mural custom painted by San Diego Artist Rafael Lopez who has also completed a mural for the front of the restaurant. 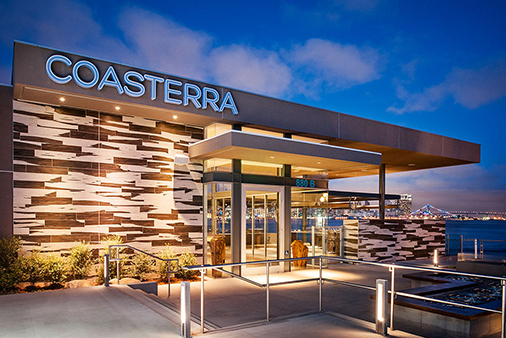 In addition to a full-service restaurant, Coasterra will also function as an event venue: a banquet room with its own outdoor deck has nearly 600 seats. The most distinguishing feature is the floating event platform with capacity to sit 400 people, the first of its kind in San Diego.